Continuing a strong form of Summer Racing for the club, Tamara Davenne headed over to Bath on Sunday for their Cotswold League Road Race. She was gunning for a high position in the league standings and pulled through with an amazing result. Congratulations Tamara! This weekend was the Bath CC Cotswold League road race, the 6th round of the womenâ€™s 2016 Steele Davis Cotswold League. My weekend started Saturday morning with a pre-ride coffee with Angus who told me all about his race in Belgium: I am looking forward to giving it a go! I then headed off for an easy 40km starting with Matt just to spin my legs before Sundayâ€™s race. I havenâ€™t raced for few weeks so I was excited to prepare my bike in the afternoon (full clean) and although I donâ€™t feel particularly fit at the moment (and I had some knee pain on my Friday morning spin) I really wanted to race for the win in order to aim for a top 3 at the GC (best 4 rounds of the series). On Saturday afternoon I felt unwell â€“ I had just enough energy to watch Greg Van Avermaet taking the gold for Belgium in Rio, it inspired me! Sunday morning the alarm rung (too early) and I hadnâ€™t fully recovered. But I entered online (I donâ€™t want to waste Â£25!) and this was an important race to be competitive in the GC of the league so Theo (my fiancÃ©) and I headed off to Yatton Keynell. We arrived at 9.13am for a 10.05am start (try to not do that) in the pouring rain and my motivation, like my form, was at its lowest. Sign in, getting ready in the car because itâ€™s raining â€“ stressed because I only brought the clothes I had on me (I didnâ€™t expect it to rain!) Luckily I kept a long sleeve base layer and a jacket in my racing bag â€“ halleluiah!). I found some energy to do a 5-10â€™ warm-up on the rollers (ha fine, I will warm up during the raceâ€¦). The rain stopped at the briefing and the sun came out (so I removed my base layer on the line, realising no one is wearing one â€“ usual last minute faff). By that time I was feeling a bit better and I seemed to have digested my usual pre-race breakfast: peanut butter/Nutella on toast (x3). The pre-race excitement kicked in and the sun boosted my positivity. The race started with 8km of neutralised section until we reached the circuit and 3 loops of this 20km rolling circuit. I knew it well from last year where I came second at the same race (one positive thing!). I knew who too look out for, the current GC leader Heidi Viles (The Bicycle Chain) and the 2nd (and last yearâ€™s winner) Rebecca Walters (Performance Cycle). In the first lap I found myself at the back â€“ the moment when you turn around and realise that the back of the bunch is you! Holy s*** itâ€™s time to do something â€“ I am stronger than this! The yoyo effect in every corner when you are at the back is tiring and it is obvious that being in the middle of the bunch is a better position. 30km in I found myself warmed up and I moved towards the middle/front of the bunch, this bunch that became smaller and smaller. The road was completely dry, the sun was shining but the wind was very strong! I knew I wouldnâ€™t get away and because of my form on the day I decided from the start not do anything crazy (I have a tendency to do too many funny things: chasing, attacking etcâ€¦) and try to stick with the main bunch (thatâ€™s how poor my form was). The second lap went well, I started to read the race and think about where I needed to be towards the end of the last lap. No break managed to get away during the 2nd and 3rd lap, despite some good efforts. I found myself well positioned in the last corner (5th on the line) with 1-2km to go (flat â€“slightly downhill), the pace increased. 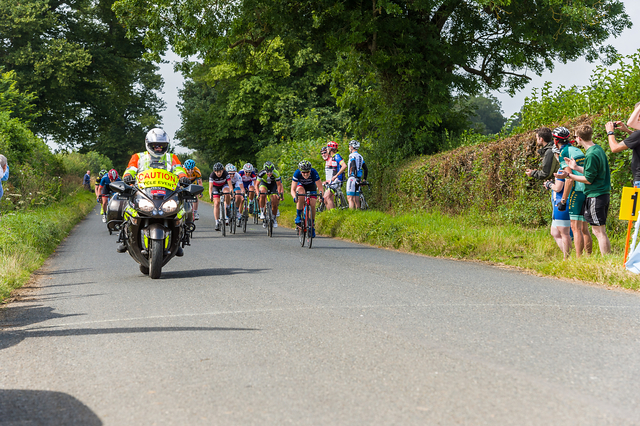 One girl from Elite Velo attacked and created a gap with more than 1km to go, we could see her getting away â€“ the leader of our line was chasing but not fast enough to catch her, I was still sheltered 3rd of my line at that time. It was too slow to catch her at that pace so I made that move around 500m, leaving my line and pushing hard on the saddle (thinking people would follow my wheel and outsprint me) I caught the girl with 200m to go, and I started my sprint â€“ no one on my left, no one on my right – Iâ€™ve just won my first ever sprint in a road race and I am moving up in the GC! Time for a recovery shake while waiting for the prizes â€“ and I felt worse than when I started. I want to dedicate this first road race victory to my dad â€“ all my thoughts were with him during that race.. I want to thank the organisers for Bath CC who organised this great race, Philip James Jewellery and Cadence bike shop for the vouchers.